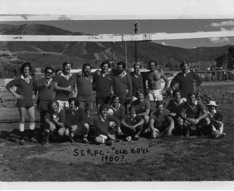 ﻿ The Steamboat Springs Rugby Football Club was founded in 1971. Headed primarily by Wayne Kakela, Lee Doucette and Val Fleckinstine, a team of a bunch of locals as players managed to put together a couple of games and play in the Denver Barbarian’s 7s. The following year, 1972, was the first year with a full schedule. 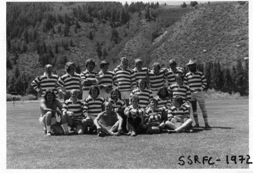 1973 was the first year Steamboat Springs hosted a tournament, the SSRFC Invitational. The tourney was such a success it was agreed that a tournament would be held in Steamboat every year. The tournament was renamed the Cowpie Classic starting in 1974. There is also a huge showing from the Steamboat Charging Heffers women's RFC and other women's teams around the region.